Looks that Kill is the latest installment in the Yuki 7 book series created by one of our contemporary illustration favorites, Kevin Dart. In this new adventure book written by story artist Elizabeth Ito, we get the opportunity to tag along with Yuki 7 and the Gadget Girls, her special task force of ladies, on one of their missions, immersing us in their thrilling world of seduction, espionage, and glamour. Accompanying the fantastic story are new and energetic illustrations by Kevin and 14 other talented artists, such as Meg Hunt and Matthew Lyons. This book is definitely one worth adding to your collection! 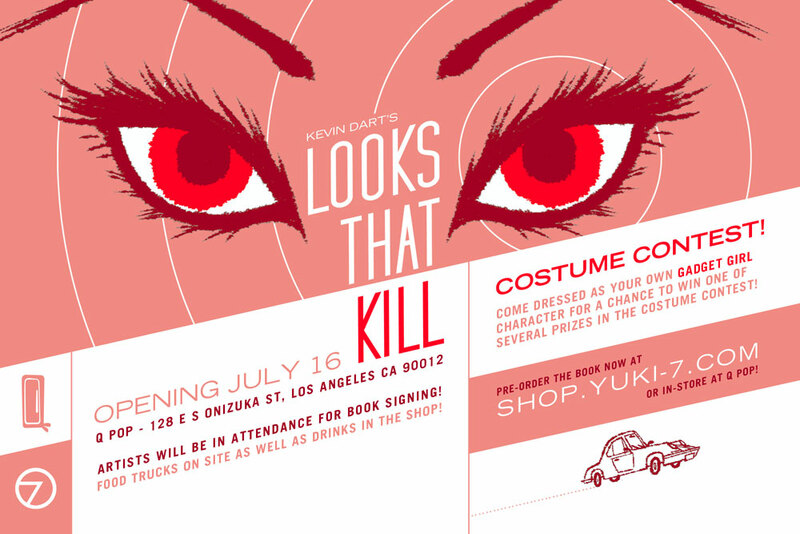 If you happen to be in or around the Los Angeles area this weekend, be sure to stop by the official book launch party and gallery show at Q Pop gallery in Little Tokyo. Be one of the first folks to purchase a copy of the book, meet the artists, and have fun! More information may be found on the official Yuki 7 site. Sign up for our Grain Edit RSS feed. It’s free and yummy!